In the rapidly growing City of Peoria, you will find the equally impressive community of The Meadows. Comprised of 694-acres, The Meadows is a master-planned community of elegant homes, surrounded by an abundance of picturesque natural beauty. You’ll find this delightful neighborhood in the 85383 zip code, not far from Lake Pleasant, which translates to a multitude of opportunities for outdoor recreation, on and off the water. The Meadows also has four community parks, with ramadas and tot lots, so it is easy to get outside and enjoy Peoria’s 300 days of sunshine. When you move to The Meadows you are positioning yourself to easily access all of the wonderful amenities and features of this idyllic desert city. 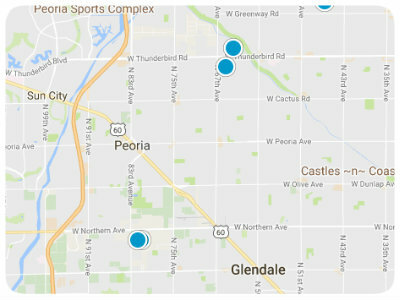 Peoria is known for its small-town charm and big-city amenities, as well as exceptional public schools and dynamic employment opportunities. The Meadows is in close proximity to the Loop 101, Loop 303, great shopping at Town Center and Arrowhead Mall, exciting entertainment options including The Peoria Sports Complex, as well as numerous fabulous restaurants. Furthermore, The Meadows community is home to multiple sub-neighborhoods, each with their own unique features and advantages. Three neighborhoods found within this outstanding Peoria community are Enclave, Estates, and Legacy at The Meadows. Enclave at The Meadows has three to six bedroom homes with 2.5 to 4 bathrooms and a 3 car garage. Enclave homes range in size from around 2,482 to 4,586 square feet of living space. Estates at The Meadows features slightly larger single-family homes with four to six bedrooms, 2.5 to 4.5 bathrooms, 3 to 4 car garages and square footage ranging from 2,685 to 4,389. Legacy at The Meadows has similarly sized homes, also boasting four to six bedrooms, 2.5 to 4.5 bathrooms with a 3 car garage and between 2,686 to 3,194 square feet of living space. In addition to these great options, The Meadows is also home to Traditions, Foundation, Fusion, and Pillar. Traditions at The Meadows offers eight new home designs from which homebuyers can choose. These homes range in size from 1,678 to 2,983 square feet. Fusion at The Meadows offers single family homes in seven distinct designs, ranging in size from 2,077 to 3,548 square feet of living space. Foundation at The Meadows features homes built by Woodside Homes, ranging in size from 1,743 to 2,634 square feet of living space. Offering three to six bedroom homes with 2.5 to 5.5 bathrooms, Pillar at The Meadows is another splendid sub-neighborhood to be considered. Homes in Pillar range from around 2,387 to 3,791 square feet of living space and also come in multiple design options. If you would like more information regarding homes for sale in The Meadows of North Peoria, Arizona, please allow us to assist you and contact us today.